A project funded by the European Commission is working to develop an infrastructure for self-driving cars. 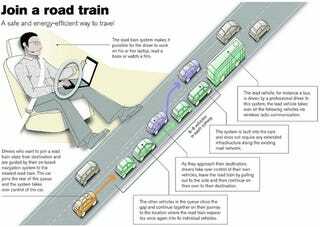 The system, called SARTRE (Safe Road Trains for the Environment), will allow cars to autonomously travel in a convoy. Also, testing begins NOW. Sartre is designed for use on long roads such as highways, where navigation is minimal and a driver will be on that road for a long stretch. Cars will communicate with each other using wireless radios and a battery of sensors. With this system, a human-controlled lead car is put in place, while all the other cars in the convoy fall in line. When someone approaches their destination, they can take control of the car, breakout from the line of cars, and the rest of the convoy will adjust. Drivers will be able to carry out such tasks as reading, working or eating, without having to completely pay attention to the road.